In the first edition of 50 States 50 Socks, there is a typo. Where it says that you should knit rows 1-42 of Chart A, it should read rows 1-47 (i.e. the whole chart). 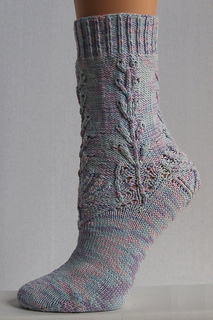 These socks were inspired by the fields of lupines in MidCoast Maine. 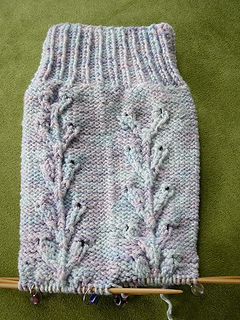 The pattern is charted, not written out, and includes lots of twisted stitches along with some cabling and some lace. 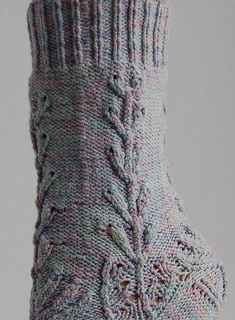 This sock represents Maine in the CD book called “50 Socks - 50 States,” which will be published by Sirius Knitting Publications.1 Dr. Laura Andersson has brought lots of designers together for this collection, including both knitting luminaries and new designers. Crystal Palace has provided all the yarn.